The skyrocketing cost of dental care at home is leading more and more Australians to consider options further afield. Former vacation spots in South-east-Asia are fast becoming attractive destinations for fun and fillings. Read on to find out more about these alternatives, and if you are seriously considering dental tourism as an option, we’ll tell you how to do it right. Why Is Dental Tourism So Attractive? However, the age old economics principle of costs being determined by demand and supply hold true in this case too. Australians are increasingly looking for affordable options elsewhere to deal with their dental care needs. This is especially true for more expensive dental procedures such as root canal therapy or cosmetic dentistry implants​ as such procedures cost a hefty amount by nature and are generally not covered by dental insurance providers in Australia. Dental Holiday Packages are therefore becoming an attractive choice for many. Popular destinations like Thailand, Philippines and Vietnam are attracting dental tourists from Australia in growing numbers. While the cost of dental procedures abroad certainly attracts the attention of Australians, what makes travelling there more alluring is the idea that one can conveniently combine a quick vacation, and squeeze in a dental visit or three while there. 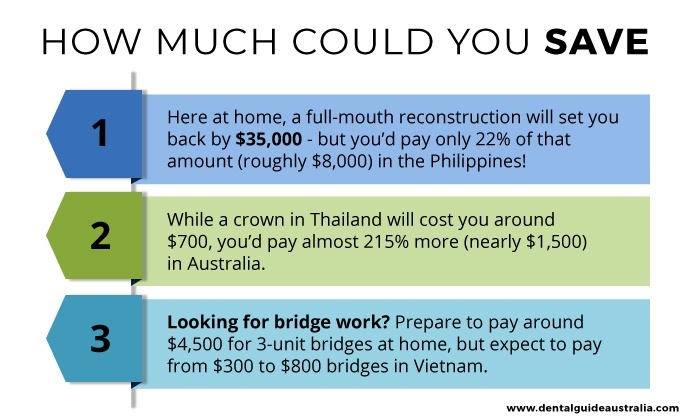 Here at home, a full-mouth reconstruction will set you back by $35,000 – but you’d pay only 22% of that amount (roughly $8,000) in the Philippines! Once a niche service, dental tourism has now gone mainstream. Australian health insurers are keen to cash in on the needs of the nearly 25,000 Australians who travel overseas each year as medical tourists, with almost 10,000 of them being dental tourists, creating a nearly $300 million annual market for the service. It's also important to remember that many dental treatments may require rectification works for minor issues, and require ongoing maintenance. Since materials and procedures differ from Australian clinics, your local dentist may not be able to service your ongoing needs. Typically, in Australia, you will have to pay on average $1,660 for a root canal procedure. But if you combine your root canal with a holiday in Bali, Indonesia, your root canal can cost you just $224. The average price you can expect to pay for a dental filling in Australia is around $200. A similar, white dental filling will cost you just $75 in Bali. You can find round trip flight deals per person starting from $550 and room deals starting from $30 per night. So if you are planning a five-night stay, building in three days of rest and relaxation into your dental treatment appointments for a single root canal, you can get it all done for less than what a single root canal costs in Australia! In Thailand, the cost of a dental crown would on average be between $350 to $700. For three separate crowns expect to pay between $1,050 to $2,100 depending on the type of crowns you choose. Some dental travel packages may come with a discounted price for multiple crowns, making it even more affordable. In Australia, the cost of a crown can be between $1,763- $2,225, depending on the dentist's location as well as which crown materials you choose. For three crowns, you will have to pay between $5,290 to $6,675. You can even get your dental crowns on the same day and have time to enjoy your holiday. A week's stay with flight and hotel costs can be anything from $820 upwards. Please note that flight and hotel prices will change with seasons. Think about it. This means you can get three crowns and a few days holiday in Bali for around the same cost as getting just one crown in Australia! There are specialised medical hospitals that combine treatments with hotel packages. To get a full denture, (upper or lower) expect to pay in the range of $43 - $180. That means to replace upper AND lower, it would cost between $88-380 AUD. In Australia, to get upper and lower dentures, including the cost of consultation, tooth removal and adjustment of dentures you can expect to pay in the range of $2,300-$4,300. While the costs might look attractive at first, there’s more at stake when making the decision to seek medical treatment of any type abroad, including dental procedures. Because it’s your health on the line, you should never make the decision to go abroad for dental treatment solely based on the costs. Know what you are getting into. Your dentist should know this clearly too. Cultural and language barriers get in the way of clarity. Clarify expectations before undergoing any procedure. Find English speaking professionals to reduce chances of miscommunication and misunderstandings. Australian dentists and medical professionals are bound by laws and regulations, including professional codes of conduct and consumer protection laws. They must tell you the risks and potential complications of the procedure you are undergoing. But overseas dental destinations may not have the same stringent requirements. Your dentist may not tell you what happens before, during and after a procedure or what happens if something goes wrong. Many destinations do not have the levels of accreditation, standards and infection control protocols that we do in Australia. But some do, and there are also accredited facilities. When problems of quality occur in Australia, you have a recourse under our laws. You may not have the same recourse as a medical tourist. So look at reviews. Do your homework. Ensure that your overseas dentist provides you detailed records of procedures performed. For example, there are over 50 different systems used for dental implants. 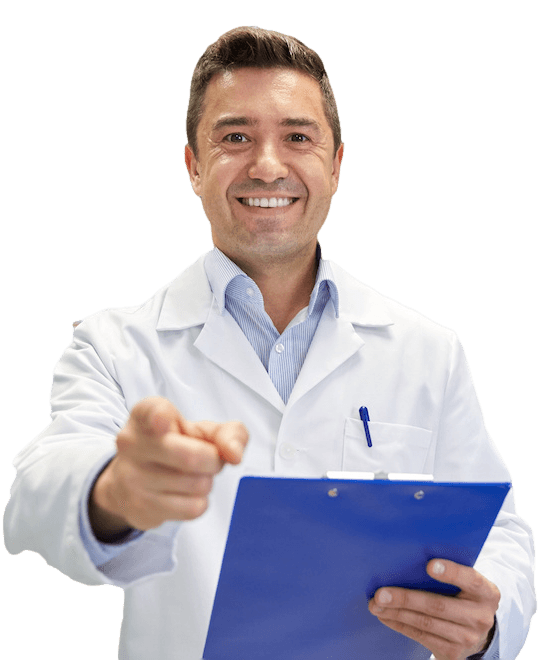 Your home country dentist should be able to figure out the details, if something goes wrong later or to complete follow ups. The bottom line is: the above risks serve as a warning for patients looking to take advantage of dental tourism, however keep in mind that they are exactly that: warnings. With careful planning, research and the correct insurance, the risks can be greatly mitigated. But before you go ahead and start your research or book your appointment, get your dentists advice with a proper consultation and diagnosis. Like any purchase decision, one needs to conduct appropriate due diligence before making a decision to undergo a specific dental treatment overseas. In fact, you should aim to conduct detailed research; after all, it's your dental health that's at stake. Making the right inquiries before scheduling the trip is absolutely essential. Who are the dentists/surgeons and support staff that will be performing the procedure? Note their names and qualifications down and do a little further research to see what you can uncover. If they are legitimate, you will not have trouble finding information about them online. What are their qualifications/ experience? Where have they been trained (preferably at reputable western institutions)? If you find that they HAVE been trained in a Western institution, go ahead and get in contact with that institution and ask them about the specialist in question. What kinds of medical governance standards does the country have to guarantee high-quality dental care? A quick search on a government website should reveal policies and procedures. Where does the institution source its medical equipment, materials and supplies, and what quality standards do they apply to ensure they only use materials of the highest quality? What sorts of guarantees, and for how long, do they offer? What happens if you develop an infection (or there are complications) upon your return to Australia? It's a good idea to run this scenario by your health care provider to see if they will cover you. Following these steps will go a long way in ensuring that you not only have some fun while you’re at your vacation destination, but that your dental procedures will be conducted by qualified and highly trained professionals in a safe and healthy environment. For more dental or orthodontic information, Visit Dental Guide Australia homepage or start educating yourself via our blog to learn more! There are a number of medical and dental tourism agencies operating in Australia, organising medical and dental travel packages to various destinations across the globe. Steps may vary from agency to agency, but most will help you in the following. Decide on times and lengths of stay - This may depend on you, the procedures you are undergoing, and the number of visits you may need before flying back to Australia. Book your accommodation and airport transfer (pickup and drop) - The agency will help you choose accommodations to suit your preferences and budget from a variety of accommodation options including hotels, guesthouses and service apartments within close vicinity of the treatment facility. Pre-evaluations - Some agencies will ask you to submit dental reports and other documentation. Some also have dental professional in Australia who will conduct the pre-evaluations so that it is easier to know the exact treatments you need and determine the costs before departure. There’s no doubt you can save a lot of money by taking a dental holidays outside Australia. Amazingly, you can actually get three crowns in Bali and a few days vacation for the cost of getting just one crown done in Australia! Australian dental treatment costs are very high. And many cosmetic procedures are not covered by dental insurance plans which means Australians have to come up with the money themselves. It is the potential for such tremendous savings that encourage tens of thousands every year to travel in search of medical and dental treatments in exotic locations. ​​​​​Make your choices carefully. There are risks involved in any dental procedure, regardless of where it’s done. And these risks can magnify the moment you leave the country. That does not mean you should forget about dental tourism. Just be extra careful. Your health, safety and happiness matters, but so does how much you pay. Do your homework well, and research with care. Look into potential offers and destinations and select a tour guide or booking firm with good ratings from others who have used their services. DO YOU CONSIDER YOURSELF A HELPFUL PERSON? We are creating a post on Dental Tourism for Australians just like you. This complete guide will answer your questions, keeping you safe and saving you thousands or dollars. We need your help! Please take 2 minutes to answer the questions in this survey. Doing so will help us answer your questions about dental tourism. The dental guide Australia is putting together a post on Dental Tourism for Australians just like you. This complete guide to dental tourism aim's to help you make the right decisions about dental tourism, keeping you safe and saving you thousands or dollars. But we need your help! Please take 2 minutes to answer the questions in this survey. Doing so will help us answer your question​s about dental tourism.